Optimal Trajectories in Atmospheric Flight deals with the optimization of trajectories in atmospheric flight. The book begins with a simple treatment of functional optimization followed by a discussion of switching theory. It then presents the derivation of the general equations of motion along with the basic knowledge in aerodynamics and propulsion necessary for the analysis of atmospheric flight trajectories. It goes on to the study of optimal trajectories by providing the general properties of the optimal aerodynamic controls and the integrals of motion. This is followed by discussions of high subsonic and supersonic flight, and approximation techniques to reduce the order of the problem for a fast computation of the optimal trajectory. The final chapters present analyses of optimal reentry trajectories and orbital maneuvers. 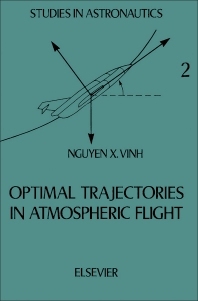 This book is intended as a reference text for scientists and engineers wanting to get into the subject of optimal trajectories in atmospheric flight. If used for teaching purposes, the book is written in a self-contained way so that a selective use of the material is at the discretion of the lecturer. The first 11 chapters are sufficient for a one-semester course with emphasis on optimal maneuvers of high performance aircraft.